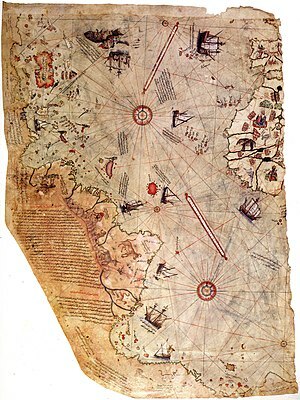 The surviving fragment of the 1513 Piri Reis world map. The Piri Reis map is the surviving fragment of a 1513 world map compiled from previous sources by the Ottoman cartographer Piri Reis . Only about a third of the original map still exists. It shows relatively accurately parts of the coasts of Europe, north Africa, Brazil, the Azores, the Canary Islands and Japan. North and South America are not accurately depicted, with some substantial errors. Significantly, an error in the depiction of South America has been interpreted by some to be a depiction of the coast of Antarctica, without the current icecap. See the Wikipedia article on Piri Reis map. This page was last modified on 15 February 2017, at 07:07.